1. It's all about Alibaba: Alibaba (BABA) is set to release its first earnings report since its mega IPO. Investors are eagerly anticipating the results. Alibaba is now worth more than Wal-Mart. 2. More earnings: Plenty of other companies will also be releasing quarterly results. Other big names reporting before the opening bell include Burger King (BKW), Office Depot (ODP), Estee Lauder (EL) and CVS Health (CVS). 21st Century Fox (FOX) will report after the close. 3. Elections and economics: Midterm elections have arrived in the U.S. The results will determine what President Obama can get done in his final two years in office. They will also tee up the 2016 presidential contest. The European Commission slashed its expectations for eurozone growth in its latest autumn economic report. The commission now expects the economy will grow by only 0.8% this year, 1.1% in 2015 and 1.7% in 2016. It also gave major downgrades to the outlook for the two largest eurozone economies — France and Germany. The eurozone continues to struggle with terribly low inflation and high unemployment. At 8:30 a.m. ET, the U.S. Census Bureau will release September data on the trade balance. 4. Market moves: U.S. stock futures were moving lower ahead of the open and European markets were also declining. The market mood appeared to have soured after the economic forecast came through from the European Commission. U.S. stocks closed little changed on Monday. The Dow slipped 24 points and the S&P 500 barely budged. 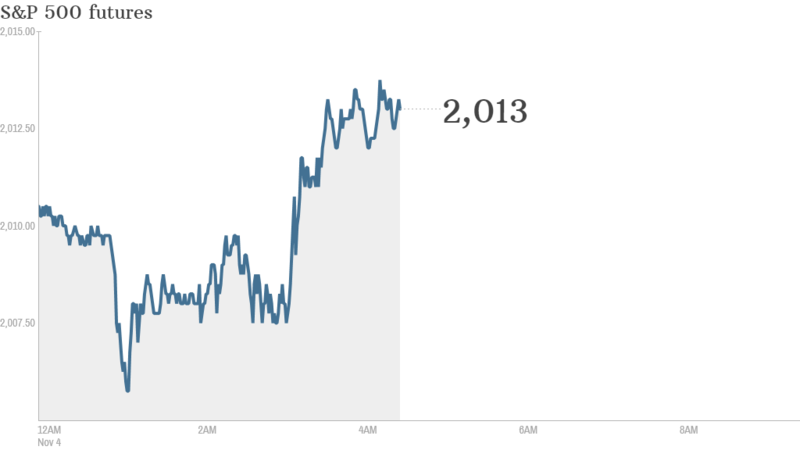 The Nasdaq was up just shy of 0.2%. 5. Turning Japanese: The Nikkei topped 17,000 in early trading — a level not seen since 2007 — as investors continued to cheer the Bank of Japan's decision to inject more cash into the economy. The Japanese yen continues to weaken versus the U.S. dollar.